I created a list of 20 colours for my Hue-challenge. You're free to use it too, if you want to. I think I'll try to stick to using only the specific colour, but I'm not sure how easy that will be. I also wanna try to draw different ages for this challenge, I'm not sure if I'll draw daily... probably not... but we'll see. I saw some art for Huevember recently, I think I wanna try something like that too. Off course officially Heuvember is in Noevember, I don't think I wanna wait that long. 20 January it was my 12th deviantart birthday. 12 years... it feels kinda odd, cool though. I'm making a little thing where I try to pick my favourite traditional and digital for each of the 12 years. BTW it made me realise I probably wanna change my DA gallery and make a folder for every year. These days you can already sort the art in a gallery on category, so sorting stuff on "digital", "traditional" etc. also, I haven't keep up with folders like "OC's" anyway. You can also search galleries these days, so folders per year seems nice, it will give me a quick look into what I made per year. BTW, I seem to have an artblock... I have felt very inspired to tidy and clean though, so I'll have a fairly clean and tidy apartment by the time my art-inspiration comes back. I've considered, doing YCH ( Your Character Here ) commissions, auctions or something like that. Any tips for this in general? PS: Why the YCH here thing? One of the more difficult parts of drawing is for me to come up with a pose, what if the customer wants something difficult, what if I just can't find/think of a good pose while the customer has already payed, with a YCH thing, I have already done on the most difficult things and I can get to the more fun parts. Made quite a bit of traditional art this year though. I decided I wanted to start preparing for Inktober a bit earlier this year. In 2017 I thought the solution would be to combine Inktober with Sketchtember, but I didn't finish Inkotber that year because having daily deadlines 2 months in a row was just to much pressure. So this year I wanna start even earlier with sketches and stuff. With this series of drawings I always have up to 4 sketches of bodies ready in case inspiration strikes. This Inkotober I also wanna try to make "finished" ink drawings. BTW anyone else planning to do Inktober this year? I'm having so much fun with this series of drawings. I have all the drawings, and also WIPS hanging on the wall behind my computer screen. I decided it might as well be fun to have them here all together on my front page too. BTW I didn't finish my second play with the Brujah... it was too much like the Toreador and there for kinda boring, so I decided to play as a Tremere instead. I just found a completely new part of the game that I managed to completely miss the first time, a weird maze in Grouts Mansion. As it turns out VTMB was for sale on steam for their summer sale, so I bought it for 5 euro. That was around the 4th of Juli so I've been playing for a while. The fun part is that, while I've seen Gopher play through the whole thing ( a very fun let's play in my opinion ) he played with the basic patch, so there where still some surprises for me. I finished my first play through a few days ago, and immediately started a new game, I've only tried one clan so far ( Toreador ) but I wanna try the others too, so I'm now playing as a Brujah vampire. Actually, now that I think about it... it might not have been the broad sword yet, I'm not sure... it could also have been the cheap katana I picked up earlier... still... I had A LOT of fun. Well since the last journal was from April, I guess an update is in order. I was very busy with a different, very big, project. I’ve been tidying my apartment following the Konmari-method. As far as possible you only keep the stuff that “spark joy” aka make you happy. *= Komono is pretty much all things that don’t fall in the other 4 categories, for example mugs, CD’s, pens, etc. This has been a project that has kept me busy for the last couple of weeks. It is very important to me to reorganise my apartment, and I actually have started to enjoy the process. I’m getting rid of stuff I no longer want or need and create more space and also hopefully a simpler household so I have so spend less time tidying and cleaning ( or feeling guilty that I should be tidying and cleaning ) and more time doing the things I love. Konmari-ing through my pens and ink has even already made me excited for Inktober. So far art April isn’t very successful for me. - The time: 3 days per drawing might actually be a bit short unless I’m able to fully devote my free-time to drawing… but I off course get distracted by other things. Also digitally 3 days might work since I can for example, colour a complete background in a smooth, solid, colour with 1 click with my mouse… but when working with for example colouring pencils, 1 day might not be enough… also I sit far more hunched over when working with colouring pencils so I can also work with them less long in general without getting a sore neck. - I get distracted: I found someone on YouTube who does let’s plays of the Fatal Frame/ (Project) Zero games, the original Japanese games, it’s so awesome, so scary, so addictive, so distracting… I keep telling myself I’ll draw while watching but with this game that’s so hard to do. I would really like to do something like this! I think want to do an art-challenge for April. At first I was thinking of doing a sort of April-Inktober… Ink-april?? But I realised I always have a hard time with challenges where you have to make 30/31 new things… I remember last year having days where I just quickly scribbled something cliché because I still had too, it was late and I actually wanted to go to sleep already. - 1 day for sketching, 1 day for inking, 1 day for colouring. - I also hope to try many different mediums, traditional, digital, fine-liners, dip-pen, colouring pencils, markers, etc. So I think I have to start brainstorming ideas, and perhaps also start collecting some references etc. Or make a list with 10 subjects or something… I do think it’s important to do some preparing… it would be a shame if I failed to make a sketch on day one. SMVillage, or SMV for short, is a Sailor Moon community for all otaku senshi (fanmade Sailor Senshi/Scouts). Here, your characters can meet other characters and explore the Silver Millennium Village, a resort in Crystal Tokyo specifically for senshi. You may submit your character whenever you like -- there are no open periods or deadlines! We have all sorts of events for your characters to participate in. When I've finished 10 quests, I can ask to bring another character to SMV. Yukata Quest: On July 7th, the Village will be celebrating Tanabata, the Star Festival. During Tanabata, people traditionally wear yukata, which are casual summer kimonos. Design a yukata for your senshi! Entrance Comic Quest: Draw a comic depicting how your senshi arrived at the Village. Only senshi who have completed Entrance Comics will be featured in the Village Recaps as newcomers. Halloween Quest: It’s that time of year again! On October 31, senshi dress up in costumes during the night. What’s your senshi’s Halloween costume this year? SMV Secret Santa: Please refer to this journal! 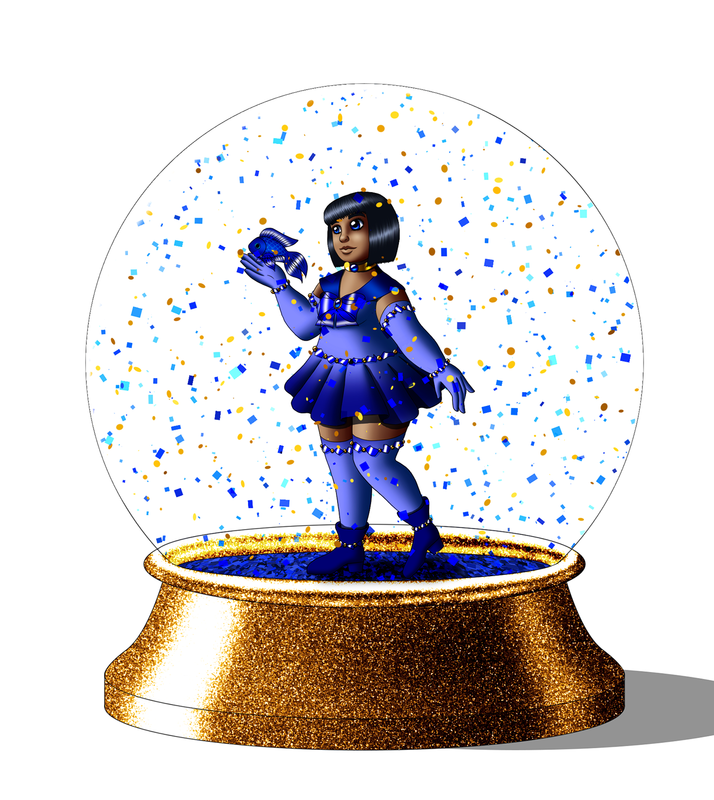 Winter Fashion Quest: Deck your senshi out in their coolest winter garb! Pun intended. This also is one of the outfits for your Outfit Meme! Pastel Friendship Quest: Draw a portrait of another member’s senshi using only pastel colors! I decided to make a new journal with a list of my OC's, I made the old one so long ago I have too much trouble finding it. BTW some characters really need a new character-sheet. BTW, please tell me if I forgot an OC. As you may have noticed over the years, I love doing redraws. They're such a great and fun way to see how much I have learned and how much my art-style has changed over the years. It's also a fun challenge to see especially with older drawings, what I elements I'm able to keep and make work, and what elements I'll have to change to make a drawing work. As you can see, I've redrawn it for two times already, it's just a fun drawing. This time however, I'm considering changing a major thing... the pose. As you can tell, those legs have always given me trouble anyway. But I'm not sure yet, I do look forward to working on this drawing again. There’s 2 things I’ve learned lately. 1. These days I appear to value productivity over perfection. I think for the longest time I felt I should ALWAYS make the best art I can make, unless I officially classified it as “just a sketch”. These days I have experienced that I get just as, or perhaps even more excited about finishing a good drawing (very) quickly, as I would about FINALLY…. Finishing a drawing that is about the best I could possibly do. 2. I may wanna consider stepping away from my semi-realism style for a bit. Back then I just drew… because it was one of the most fun things to do. The thing is that forcing myself to study realism is probably now gonna help me have fun and be productive again. - So I think my goal for now will be to stream-line my art a bit by drawing less realistic more cartoony. - I also wanna play around drawing more expressive characters and I think drawing less realistic will help me play around with expressions more. - But mostly I wanna have more fun drawing and hopefully also just draw more! PS: I have also been looking at art from Pixiv lately... there's so much beautiful and or cute art there! So amazing! But where can you start when you don’t know what to do with the body??? Off course there’s resources for poses, but I get somewhat overwhelmed by the amount of choices. Hopefully I figure this out soon, because I really wanna draw. Wanting to draw but having problems with one specific part of the process of making art? PS: How do you come up with your poses? I either use one of my "standard poses" or spend A LONG TIME looking through my How-To-Draw-Manga books and SenshiStock to find a pose. This morning I saw an email from DeviantArt telling me todaty is my deviantart-birhday. So I went to check how many years it is now... 10 years! Last year I had plans to do something special for my 10th DA birthday, like a redraw of my very first drawing on DA... but I guess I forgot. I'm still enjoying DA and have no plans to go anywhere else, I still love this place, and all the wonderful people I've met. You know what, this would probably be a good time to FINALLY make a new DA id. So now I have to figure out what style I'll go with... portrait? full figure? semi-realism, manga? And it looks like so much fun, I would like to play the game myself. It's old though, so I'll probably buy it somewhere second hand... I'm not paying Steam 20 euro for an old game that needs patches to work well. Anyway, I then also watched Gopher and Chay's let's plat of Portal 2 Co-Op, which was also a lot of fun. BTW Portal and Portal 2 are so far pretty much the only like first-person-whatever game I've ever played on PC. Then I also watched the let's plays of Don't Starve and Don't Starve Together... guess what, those look like a lot of fun too. And then there is The Forest with Chay and Gopher, that one I actually try to watch live on Tuesdays ( they're British so they play it at times where I can actually watch it live. And yet... Chay and Gopher make it look like so much fun. ( Magical ) Girls based on Gemstones? I mostly just post completely original work there, so no fanart, fan-characters or other people’s oc’s. Anyway, that got me thinking that I should perhaps try to do a project with completely original artworks again. Stuff that doesn’t need a big explanation as to who the character is I’ve drawn, and the context etc. And also art where I can experiment more because I’m not working with a specific design, I can just make stuff up as I go. Not to mention that it would also be nice and good to make art just for me. But I think it would also be good to practice making art where the most important thing is ( and probably mostly should be ) that I like it, without caring too much if others like it too. So I’m considering a project/ series of drawings with the theme: magical girls. How about I base the designs around gemstones. Gemstones I own off course so I can happily stare at them while trying to come up with something to draw. I once again have made ambitious plans for a project… ( honestly my life is filled with unfinished projects… ) but I hope to have fun with this one. Feb 6, 2018 A change in art-style? Jan 7, 2018 ( Magical ) Girls based on Gemstones?